3 Million users in the original version. 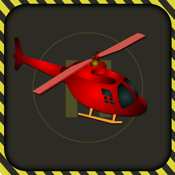 Copter Deluxe: The most awaited helicopter game!. The gameplay is very simple. Touching the screen will accelerate the helicopter to move up and releasing the touch will drop the copter down. You should avoid the helicopter touching the Hurdles and the walls of the cave on top and bottom.